Merry Christmas everyone, I am desperate to get 4 CCB arches to work in my sequences. I am running a regular LOR network for 16 channels each (8 controllers numbered 01-08) and an aux A network for a 12 ribbon CCR tree (channels 11-1D). I have the CCB arch controller data cable off the last CCR controller 1D. The CCB controllers are numbered 1D,1E,1F, 20. The LOR hardware utility recognizes all of the controllers and all data controller light glow steady. 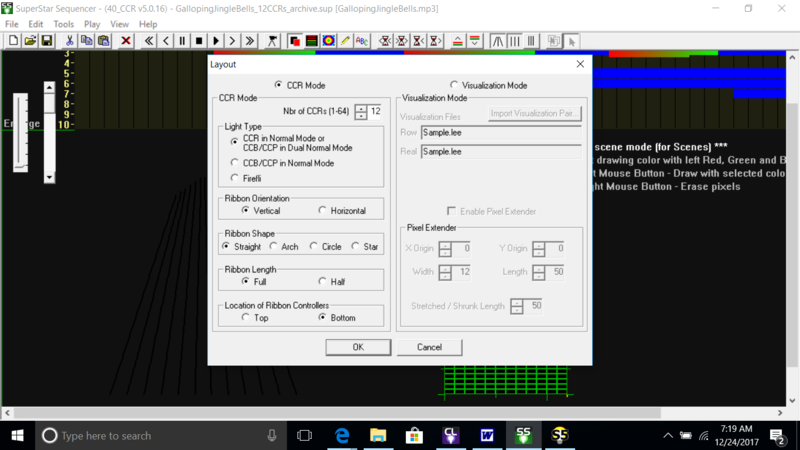 I cannot get the CCB controllers to perform in any of my sequences. I will also mention that the CCR and CCB sequences are built in Superstar, exported, then inserted into the main sequence as subsequences. The CCR's work perfectly. CCB zip, nada! What is the network configuration (speed and enhanced or not) for the AuxA network? In SuperStar, are you using a Visualization file to set the channel layout? If so, have you verified that the channel and network settings are correct in the Visualization file? expand one of the rows used for the CCB controller. Click on the pixel and a dialog box will pop up. In that dialog box you will see the network and unit ID used for the pixel. Is it what you expect it to be? If it is, try playing the exported sequence "stand alone" and see if it will play to your CCB controllers. Brian. Opened the sequence and it does not show what it is supposed to be. It should be unit 1-D and it shows unit 11 which is the controller for the first CCR ribbon. 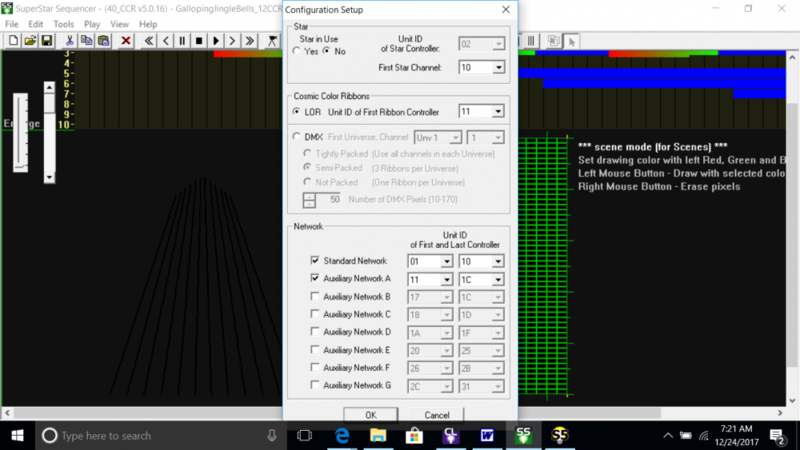 In superstar, click on the Tools menu and select "Configuration"
Also, in the network section, select Aux A network and have 1D, 1E, 1F, and 20 be within the range given for the Aux A network. For example, if the CCB controllers are the only thing in this sequence then you would set the first unit ID of Aux A to be 1D, and the last unit ID of Aux A to be 20. Brian, will this change effect my CCR;s as well. Or, you saying to open the superstar arch sequence and make the change only there? Are you sequencing the arch sequence by itself, or are the CCRs and arches sequenced together? You said you are not using a visualization, so you must be in CCR mode. 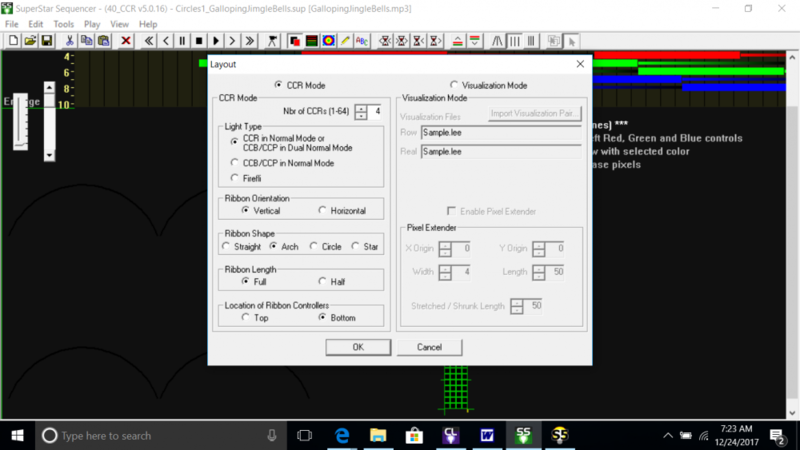 In CCR mode you specify the number of CCRs you are sequencing in the Layout dialog box. Then in the Configuration dialog box you specify the unit ID of the first CCR and the rest get assigned consecutive unit IDs after that. Brian, I believe the answer to your question is yes. I built separate sequences for the CCR's and arches. The CCR sequences built in superstar have been used for several years. The arch CCB superstar sequences were built this year. Both the CCR and CCB superstar were saved and exported then have been inserted into the main LOR sequence. Here is what I have done this morning. Please let me know if this is correct. the system will not allow me to load the screen shot of the CCB configuration but here are the specs"
Brian: I ran a test on demand show with only the one main sequence that has the two sub sequences inserted into it and neither the CCR or the CCB did anything. The settings above look good. I would first run each of the exported sequences "standalone" and confirm they control their respective lights. I have personally run more than one subsequence in a sequence and have seen it work. Subsequences only run when the subsequence channel is on. Be sure you have turned on the subsequence channel for the entire length of the sequence.